As long as I can turn my tongue in my mouth.How many times before you speak? I do have something to say about T.I's; Dogs sold for hunting ( which I will not do)and and puppy mills where some breeders are using our endangered breed solely to make money. That makes me want to vomit. Forgot shaved dogs. Has anyone read a standard for the Barbet lately even if it is not current? Will be fun to see how some Barbets are shown next week and this summer.Holy tamale. Got up at 5 because Coccolina was needing belly rubs and it is now 9 and I have updated you on most stuff I know. I thought I would go back to bed at 7 for a snooze, but with the birds singing in the garden and the quietness of a sunny weekend morning, I stayed up. It's hard sometimes keeping up and keeping you informed having 6.5 dogs(6 with long coats),a garden and a fulltime job. You need to be real organized...I guess. Now, I need to groom the ones going to the Club show in 2 weeks. Why now? Because you don't wash them the day before or they will have a "poil mou". Seeing the judge is a PWD judge, we need to make sure our dogs look at least as nice as them, but not shaved! The beauty of having several dogs under one roof is seeing them interact. It's dog TV, live. 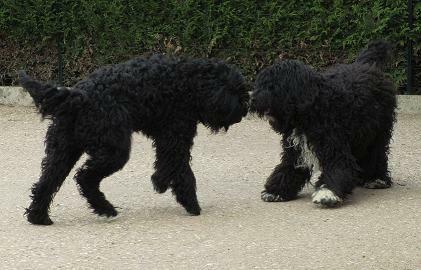 I firmly believe in all dogs being together and interacting.I love to see them all playing together. Of course, I am blessed for having several dogs and being able to share them all with you at the same time! 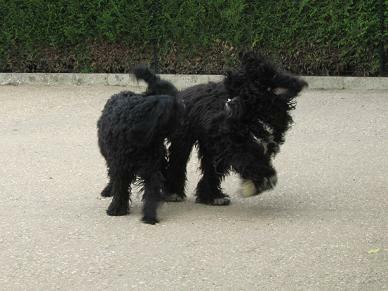 You all, lucky people going to be receiving your club bulletin 99 full of lovely huge beautiful color photos and lots of information about......the Spanish Water dog*. 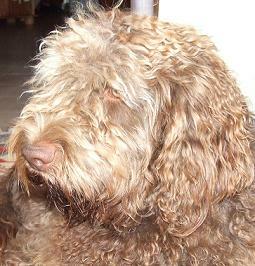 I know, I know, last time it was a bulletin dedicated to the Lagotto. what can you do? 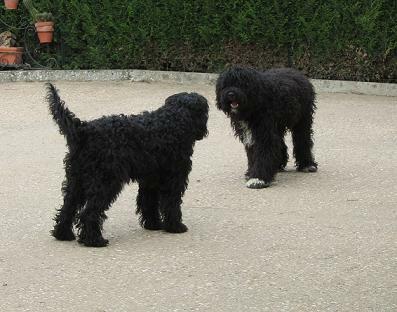 There are more Lagotto people at the club, than Barbet. Our day will come. Don't know when, but it will, I'm sure. Well, yes, some have had lots of time to lower the size of their production. I know. Perhaps it should never have been raised in the first place for what good it did? * beautiful dogs. Some even look like Barbets.Or is it vice versa? 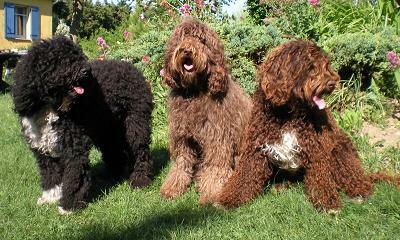 Dixie, sister Dalie and Fanny all daughters of Booly Wooly and Coccolina in 2 different litters. Interesting to see the shades of brown. In a not so distant past, things would just be taken off my site...now, that as many other has become generic. 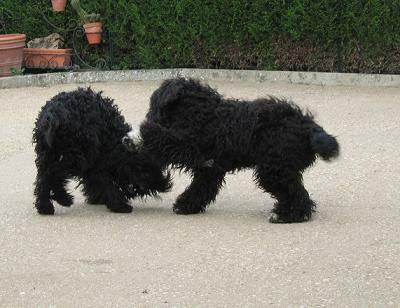 Looking forward to the French Barbet club's pedigree database for the breed they manage. Lovely masculine head and wide chest that you won't see because of the glare of the photo taken indoors with the flash, so I'm sharing the best with you as we don't often see him! Escot is also a Che and Cacao pup.